Prototech continues to ensure the satisfaction of its customers and is continuing its international expansion. The company has indeed implemented a number of initiatives to develop its rapid prototyping services in English-speaking and German-speaking countries. As a result, several recruitments have been made to ensure the continuity of our structural development in these new markets. Prototech Asia, a specialist in plastic parts prototyping, started 2017 winning many projects requested by new customers in Asia and Europe. In fact, the recruitment of a German employee allowed us to translate our website into German to be able to communicate with German-speaking companies (in Switzerland, Austria and Germany). The translation of our site into English in parallel has also generated many 3D prototyping requests from new countries (Mexico, Qatar, the United Kingdom, Croatia, etc.) in very diverse sectors. The success of our international development is such that it has prompted us to enlarge the Prototech team. 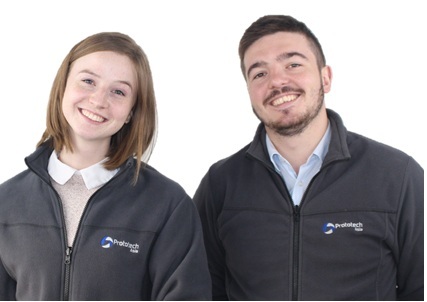 Prototech is delighted to welcome a new member, Arthur Morche, to its sales team. Thanks to his previous experience in the industrial sector, Arthur will be in a very good position to give you technical advice and monitor the implementation of your projects. Trilingual in Chinese, English and French, he is the natural contact to ensure communications with our international customers and the follow-up of their files. At Prototech Asia, we strive to offer you optimal service with a rapid response, which explains this choice of recruitment. We warmly welcome Aline Winterhalter to our international sales team. She will support our German customers in order to find the best solutions for their Problems. Due to her various experience in Chemical industry in Germany she is familiar with technical procurement processes and can help you not only by the selection of materials, but also in technical terms or in scheduling. In addition, Aline will improve the website to provide even more useful information and tips. In addition, Prototech has also decided to participate in several new international trade shows. With this in mind, we will be in attendance at NPE2018: The plastic show to be held from 7 May to 11 May 2018 in Orlando, Florida, United States. We will meet there with key players in the plastic industry and demonstrate our rapid prototyping know-how. In fact, our mastery of CNC machining and vacuum moulding allows us to offer 3D visual and functional prototypes made from the real plastic material and with good finishes, as well as small series of plastic parts. This trade show, considered the most important in the world in the plastics industry, brings together all the different players in the sector such as manufacturers, buyers and distributors. NPE is an opportunity for participants to develop their network and update their knowledge of the market. We wish you a good rest during the holidays and hope we will be able to support you with more of your projects. Thank you once again for your confidence in us!